Modern antibacterial chemotherapy can be learned from a range of more or less sophisticated international textbooks [1–6]. General and specialized scientific journals frequently report on new developments and trends of antibiotic therapy. Scientists from the United States, Japan, and Western Europe meet frequently at international congresses like the Interscience Conference of Antibacterial Chemo-therapy (ICAAC) or the International Congress of Chemotherapy (ICC). 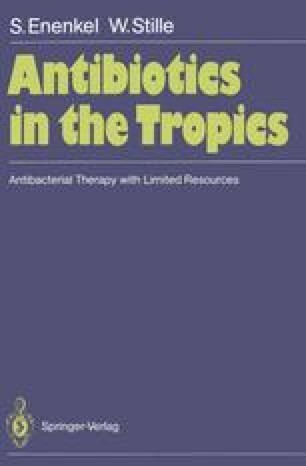 The abundant literature on antibacterial chemotherapy deals mainly with “international standards” of chemotherapy, according to which modern antibacterial chemo-therapy of severe infections is carried out mainly with the newer cephalosporins, modern penicillins, and aminoglycosides. The principles of treatment with these modern agents are doubtlessly well adapted to the countries of origin of the scientists describing them, and accordingly the belief that these principles are internationally accepted is commonly held in these countries.